You know the expression “it’s a nice place to visit, but I wouldn’t want to live there”? Well, that doesn’t apply to Mineral Point, Wisconsin. Here’s a link to a 9-minute film, which has been in the works for over a year, that helps explain why people choose to live in Mineral Point. The film features interviews with Aaron and Monica Dunn, Kristin Staver, Julia Dailey, Rod Schlimpert, Lowry White, and Jerry Cassidy. It was directed by Kerry Shaw Brown whose work includes those great Culver’s commercials. The project was initiated by the Mineral Point Economic Development Committee and was financed jointly by Cummins and the Sielaff Corporation. 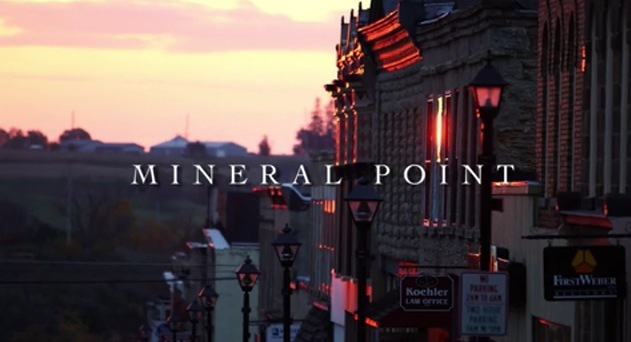 Feel free to share the film with anyone and everyone to spread the word about the wonders of Mineral Point – a nice place to visit, where you do want to live. This entry was posted in General and tagged Aaron and Monica Dunn, Cummins, Jerry Cassidy, Julia Dailey, Kerry Brown Shaw, Kristin Staver, Lowry White, Rod Schlimpert, Sielaff Corporation. Bookmark the permalink. Thanks you so much for this! Of course, I loved the video. And, of course, I love Mineral Point, too! I’ll try to get this out in my next update. Love the video of my home town. I left when I was eighteen and now live in a small town called Murphys in California. It is a one of the old gold mining towns. It is possible that many of the lead miners from Point left to find gold in the area where I now live. The towns are alike in many ways. I loved the freedom we had to explore, the parades we were in as children and my favorite place of all the giant swimming pool. I swam there last summer with my grand children. They could not believe how big the pool is. They also enjoyed the old wooden merry go round that has been there since I was a child. I am always happy to see that it is still there when I visit.